In Guatemala, Brazil and other Latin American countries, statues of saints are carried through the streets in elaborate processions during “Semana Santa,” Holy Week. Before the processions begin, people decorate the streets with carpets of colored sawdust, sand and flowers arranged in intricate designs portraying religious themes, animals, flowers, patterns, and their indigenous culture. 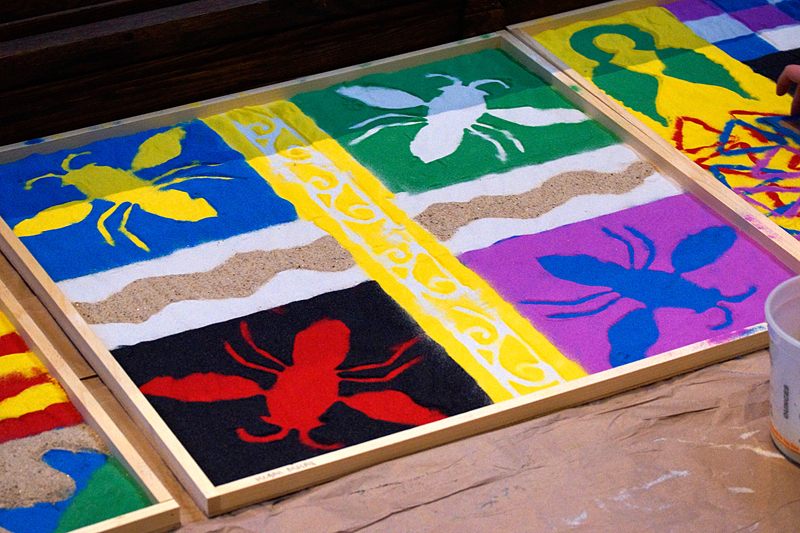 In this spirit, College of the Holy Cross students in Fundamentals of Drawing with Professor Susan Schmidt have created a sand carpet leading to the steps of the St. Joseph Memorial Chapel for Palm Sunday. Each student made cardboard shapes of “creatures with wings” to stencil layers of colored sand in their section of the carpet. The students’ designs feature angels, bees, a phoenix, dove and other birds, along with crosses and abstract patterns. The carpet, spanning about 24 feet, will be on view in the Chapel Plaza for the three Masses on Palm Sunday, April 13, and as weather permits. Masses will be celebrated at 11:30 a.m., 4:30 p.m. and 7 p.m. This project is supported by Catholics & Cultures, an initiative of the Rev. Michael C. McFarland, S.J. Center for Religion, Ethics and Culture to explore the diverse ways that ordinary Catholics experience their faith in countries and cultures around the world. Learn more about the Easter carpets, or tapetes, in Brazil.